Lakeside Get-Away is a located on beautiful spring fed, sand bottom, Little Hills Lake with excellent swimming and boating. Enjoy the beauty of Central Wisconsin's woods from the comfort of our deluxe three bedroom bath and a 1/2 vacation home, complete with 2 spacious decks, sauna, oversize fireplace, waterfront pier, bonfire pit, paddle boat, rowboat, canoe and kayak. The Lakeside Get-Away is decorated with all new furnishings in the lodge look making the atmosphere perfect for your getaway. The house includes a fully equipped kitchen, gas grill, washer & dryer, 2 TV’s, DVD player, and plenty of outdoor furnishing to complete the decks. The view from the living room is enough to melt your busy heart and get you to step back for a while and relax. This charming year-round home is perfect for family, friends, retreats or romance in all seasons. Winter Wonderland: Just 5 miles away is Nordic Mountain Ski Hill. This ski resort offers runs for the whole family while encompassing a wonderful family atmosphere! Nordic Mountain also has an awesome snow-tubing hill for those who don’t ski or areas include Granite Peak, 1hr. & 15 min. and Cascade Mountain, 50 min. Waushara County has wonderful snowmobile trails throughout the county for snow conditions. The area boasts of 96 lakes, so ice fishing is at a premium. The local marinas can outfit you with bait and tackle. Area Golf Haven: Many challenging golf courses located nearby. There are 2 golf courses within 4 miles of Lakeside Getaway; Waushara Country Club, a lovely 27-hole course open to the public and Two Oaks North, a wonderful 18 hole course. There are also many more courses located with 30 minutes of Wautoma. Detjens Deluxe Vacation Rentals, LLC has been in the vacation rental business for over 26 years. Our goal is to help guests find the perfect getaway. Whether your getaway is a few days or a week, time away from it all is so important and making lasting memories is what life is all about. We have created deluxe getaways with all the comforts of home and even more. We go to great lengths to provide quality properties that we are proud to say we manage. The Detjens purchased their first lake home over 26 years ago in the Wautoma area because it was not too far, but far enough from home. Wautoma, being just 2 hours north of Milwaukee, 1 1/2 hours north of Madison, and 1 hour west of the Fox Valley, it is a perfect distance for a weekend stay. Waushara County is an amazing county located in central Wisconsin. This small county boasts of 96 lakes and miles and miles of trout streams and rivers. Loaded with rolling hills, pine forests and wildlife, we call it, “The gateway to the north" , It feels like you are in beautiful, upper Wisconsin without the drive! available for storing bikes golf clubs etc. beautiful view and super clean! Definitely a great getaway home to rent! My husband, our dog and my parents stayed here for three nights! We didn't luck out with the best weather. However the home was so nice and cozy we all still enjoyed ourselves very much! We were still able to fish and enjoy the very relaxing hot tub and sauna. We also played lots of fun games, some that we brought and some that were provided. I'd definitely recommend renting this home for a relaxing getaway. Also we had a minor issue with the coffee maker and mentioned it to the cleaning staff that was next door and within a couple hours a brand new coffee maker was dropped off to us:). The owners and staff are all friendly, accommodating and go above and beyond to make sure you have a wonderful stay! Everything was perfect! Lake is crystal clear. Hope to go back! The cabin was wonderful, the scenery was great and we had everything we needed for a great weekend. We will most certainly be back for another stay soon!!!! 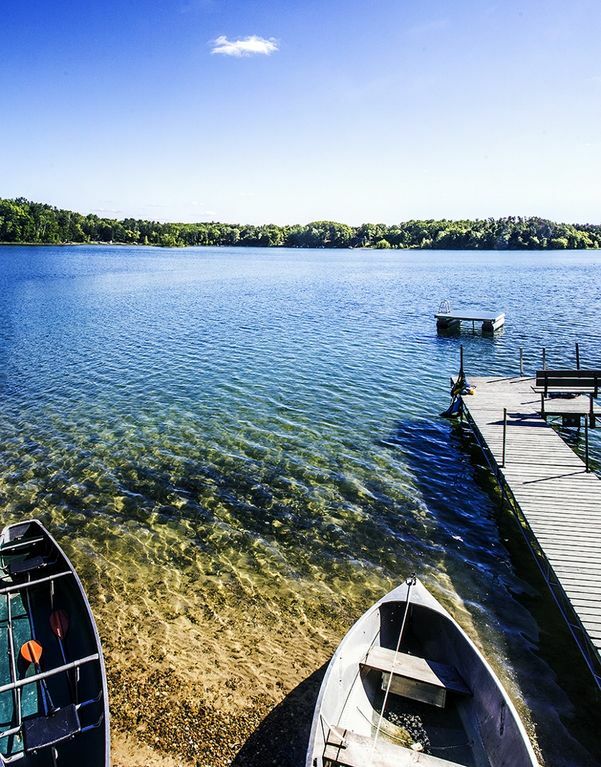 Family owned and operated, Lakeside Get-Away Vacation Rental is ideally located for families who wish to experience the great outdoors, and still partake of more urban pleasures. Two challenging golf courses, tennis courts, boating, horse-drawn hay and sleigh rides, downhill and cross-country skiing, ice skating, snowmobiling, horseback riding, hot air balloon rides, hiking trails, canoe trips, biking, Mountain Biking trails, fishing including excellent trout fishing, superb hunting (deer, turkey, duck, goose, pheasant and other small game). Wonderful restaurants nearby antiquing and shopping and a performing arts center are just a few of the vacation delights awaiting you. Golf: Many challenging golf courses located nearby. There are 2 golf courses within 4 miles of Lakeside Getaway; Waushara Country Club a lovely 27-hole course open to the public and Two Oaks North a wonderful 18 hole course. There are also many more courses located with 30 minutes of Wautoma.